Sign into your account and click on the submission that contains the supporting document request. 3. Scroll through the application until you see the area in the application with information regarding the supporting documents. 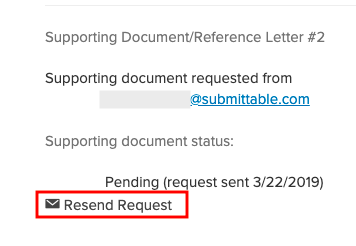 Below the supporting document field, you will see an option to Resend Request. Click on Resend Request and a follow-up request will be sent to your document provider, reminding them to subm materials on your behalf. 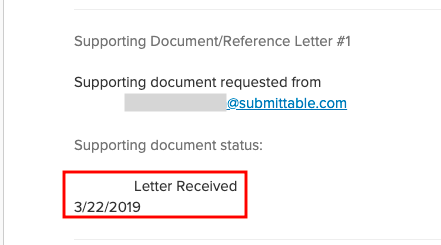 If the document has already been received you will see an indication that says Letter Received, along with the date that it was received.